OK. You have made it all the way to Paxos, or maybe mainland Greece. That was enough travelling wasn’t it? No, there is more. Antipaxos. But how to get there? Should I drive a hire boat to Antipaxos from Paxos? Sure, why not. And in this post I will tell you why. Antipaxos is a very small Greek Island with lovely sandy beaches and crystal-clear aquamarine water which you would expect to see in much more exotic locations. And why not drive the boat there yourself? We did. Read on! Where can you get to Antipaxos from? You can get a taxi boat to Antipaxos from the three main towns in Paxos which are Gaios, Loggos and Lakka. You can also join trips organised by tour operators that take in Parga as well from mainland Corfu. But most people take a boat in the morning from Gaios, the capital of Paxos, and return late afternoon. How did we get to Antipaxos? Our first taste of Antipaxos was on an organised trip with Olympic Holidays. And it was a day trip that first took us to Paxos, from a holiday in Corfu at a TUI hotel. This is why I don’t turn my nose up at tour operator excursions – they can be a great way to experience a place for the first time without any hassle – all the organising is done for you. And once you have enjoyed your organised trip you can always sort your own trip out the next time you want to go somewhere. Ok – we have done the organised day trip – what next? When we booked to return to Paxos the number one thing on my list was to hire a boat and drive it to Paxos. Do you drive a boat? Or sail it? Where can you hire a boat from? We were staying in Lakka, so that is where we hired our boat from. I didn’t want to have to get to Loggos of Gaios to pick up a boat, I wanted to be able to wander down to the harbour in Lakka in the morning, get a boat and head off. 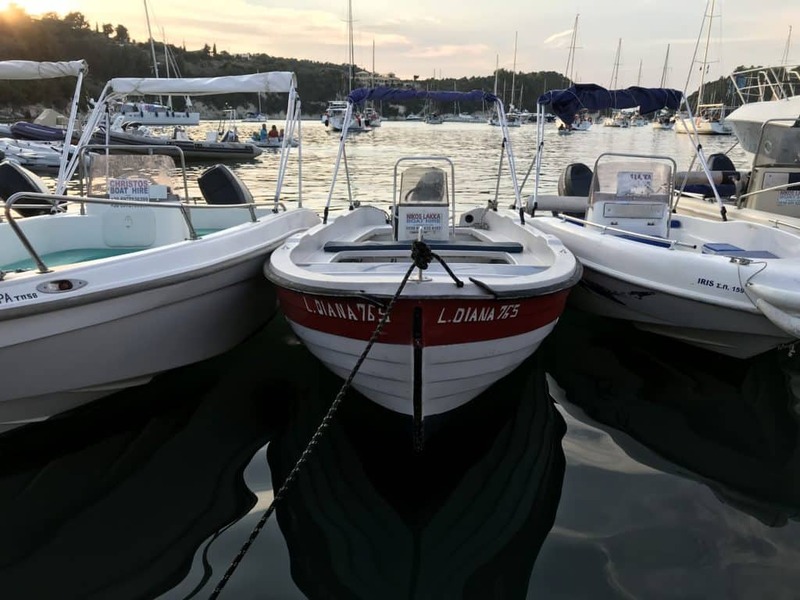 I am sure there are endless other places where you can hire a boat from in Loggos and Gaios – just pop on the internet or walk around the harbours and you will see the boats for hire. We hired a boat through our very nice and helpful Olympic Holidays rep Sam. One of Sam’s offices was the pool bar at Hotel Bastas where we were staying. Nikos Lakka boat hire – tel 0030 6976326165 (this is who we got our boat from). This is our boat. It was moored in front of our favourite cocktail bar Romantica. L. Diana 765. I kid you not. How much does it cost to take a boat from Lakka to Antipaxos? The price varied massively depending on who you asked. We were asked what size engine we wanted, 2 stroke or 4 stroke? It has an impact on how much fuel you use apparently. I just wanted a boat to be honest. I didn’t really care – I just wanted a boat that would get us round the island, to Antipaxos and back. We used 45 euros of fuel on our epic boat trip. So, 105 euros for the most excellent of days. I have to be honest the engine sounded like it had seen better days, but it got us there all fine. After a very brief induction on how the boat works (engine on and engine off) we were left to our own devices. 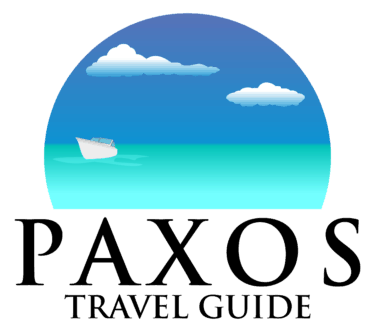 Is it safe taking a hire boat from Paxos to Antipaxos? If you are not comfortable taking a boat out of the harbour and around the island, then don’t. If you are happy then carry on. Take advice from the boat hirer about the weather conditions. Obviously, the weather in Paxos is pretty settled but there are stormy days. 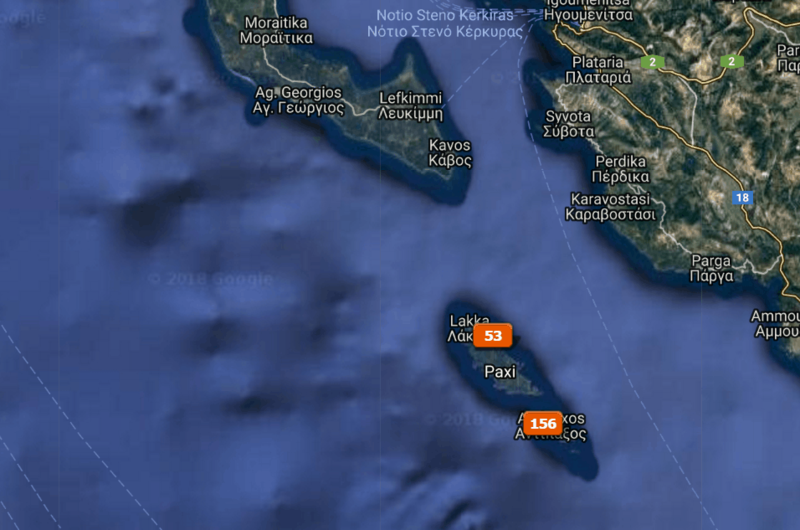 Strong winds can make the trip very uncomfortable, especially the crossing from Paxos to Antipaxos. Take advice from those who know and follow it – this is very very important. It depends how many times you stop on the way, but I reckon you can get to Antipaxos from Lakka in 1 – 1 ½ hours. I don’t really know to be honest. It didn’t matter. We just knew we had to be back in Lakka at 5.30pm. Ish. What was the crossing like between the islands? A bit bumpy but fine. You just have to be sensible and be aware of the height and direction of the waves. The basic principle I follow is to get the ride as smooth as possible by varying my direction and speed until the boat is in harmony with the sea. Where did we go on Antipaxos? The first beach you come across is Vrika Beach. If you have never been to Antipaxos just go there. It has everything you will need for an afternoon. The next beach is called Mesovikra Beach. This is a pebbly beach with nowhere for boats to anchor and nothing to do! It is a lovely site that you go past on your way to the next beach. And the next beach, the third beach, is called Voutoumi Beach. This is the other beach where you can do stuff and get something to eat. On a day trip you won’t get much further than these beaches to be honest. Next time I am going to get a bigger boat and get around Antipaxos. How did we get to shore? Ok. This was an interesting bit. I will be writing a full post about our day on the boat, but this is what I ended up doing. I dropped Nickie off where the ferry drops off and picks up day trippers. It was an immaculate manoeuvre. And then I went and anchored the boat, swam back to the island and went straight for a beer. Well that is not quite the full story, but I will leave it there for now…. Eat, drink, swim, sunbathe. Relax. Chill. Take it easy. That is all I have ever done on Antipaxos. Oh yes, and fret about the boat!!! Can you stay on Antipaxos? Apparently, you can, but this is all about getting a boat there and back in the day. Can I fly to Antipaxos? Erm no. You can’t fly yo Paxos, let alone Antipaxos. Do famous people visit Antipaxos? Is there anywhere to eat on Antipaxos? Yep – on Vrika Beach you can eat lovely food at Taverna Spiros. That’s what we did. Talking of which. I left my t-shirt at the restaurant and got it back – a true story! I had faffed around with the boat, swam to shore, got to the bar to meet Nickie who had a cold beer waiting for me. I downed the beer and having stared at the boat for the length of time it took me to have my drink I managed to convince myself that that the anchor was not secure. I decided to go back and check it. 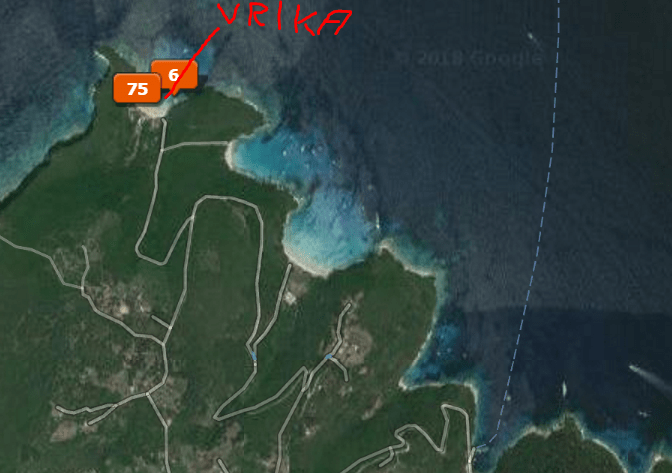 I left the bags with Nickie, checked the boat (which was absolutely fine by the way), and long story short when we got off the boat at Mongonissi I asked if Nicke had my t-shirt. Turns out I had left it at Taverna Spiros. But I was reunited with it the next day in Gaios. 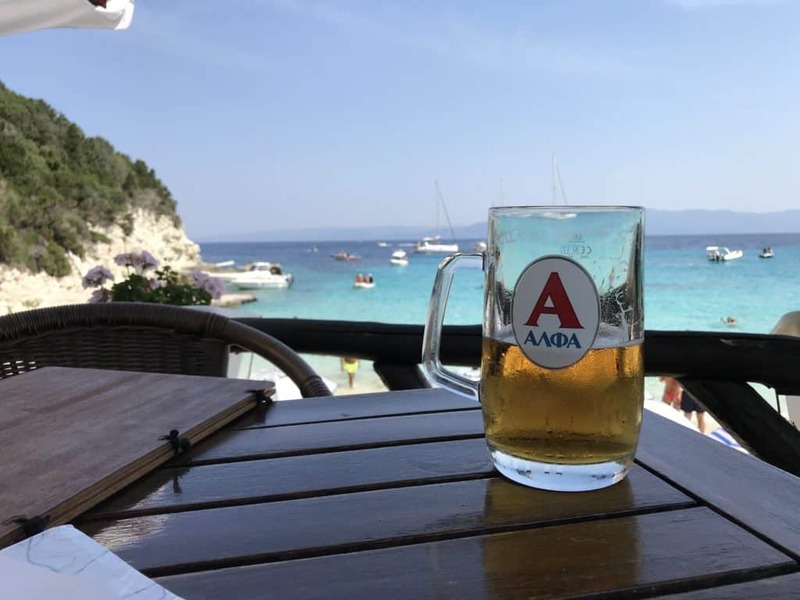 Check out the full account of this top day at at the full length post Paxos Boat Hire – Do Your Own Trip From Paxos To Antipaxos. 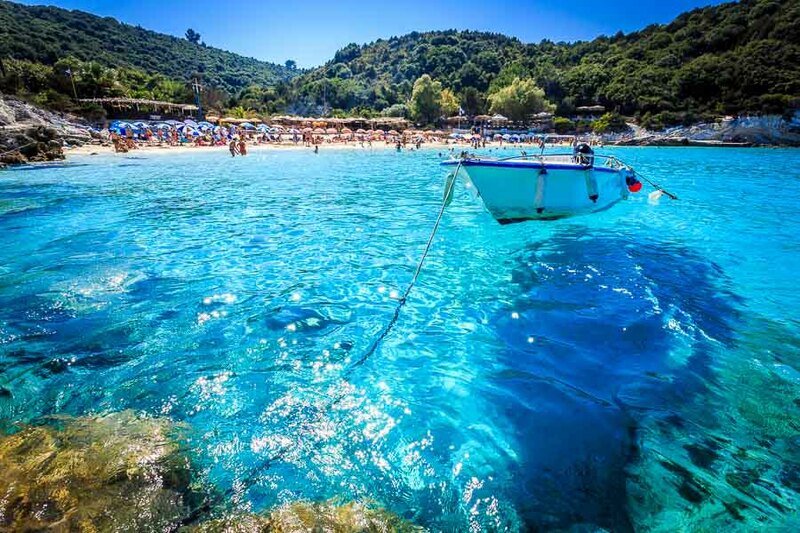 If you are on Paxos, go to Antipaxos if you like a day trip out on a boat and a few hours somewhere different with a lovely lovey beach and those famous crystal-clear aquamarine waters. I have been there twice and loved it more the second time than the first. And if you are up to the challenge get a boat and get over there under your own steam (ok two stroke engine). Next PostNext Paxos Airport – everything you ever need to know guaranteed!